The new Party of People's Freedom wants to get registered with the state and take part in this year's Duma elections, but even should this pipe dream succeed, their efforts are too little, too late. 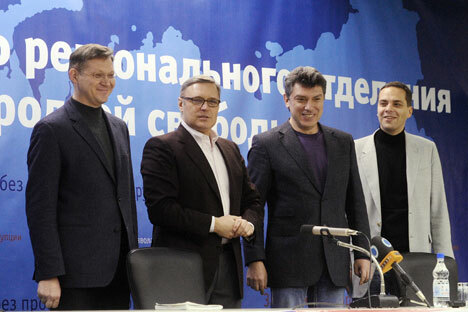 Some credit must be given to Russia’s “united liberals.” When, in the fall of 2010, four opposition leaders – Mikhail Kasyanov, Vladimir Milov, Boris Nemtsov, and Vladimir Ryzhkov – formed a new coalition, “For Russia without Lawlessness and Corruption,” many predicted that this project would repeat the fate of the numerous “liberal coalitions” of the past: a short life followed by a precipitous collapse under the weight of internal squabbles. On the surface, the unexpected longevity of the new coalition could be a result of the exclusion of Garry Kasparov, whose dictatorial impulses and inability to listen to any views opposing his own would be a kiss of death for any union. And yet, there seems to be another, more fundamental reason why the PNS co-founders have so far successfully navigated the Scylla and Charybdis of multi-headed leadership and ideological eclecticism. All four are “former:” Kasyanov is a former prime minister, Nemtsov is a former deputy prime minister, Milov is a former deputy minister of energy, and Ryzhkov is a former parliamentarian. Having lost their positions, some of them more than a decade ago, they spent the following years pursuing a relentless—and often very personal-looking—vendetta against Vladimir Putin. Not only did their criticism of Putin never really register with the public (no surprise given Putin’s popularity), but their focus on Putin’s real or perceived transgressions has becoming more and more misplaced as President Dmitry Medvedev rallies support for his modernization agenda. All four are smart enough to understand that they have precious little time to reverse the course of sliding backwards, into the past, into oblivion. The current election cycle presents them with the last opportunity to connect with voters who are forgetting (or have already forgotten) their names. It is their last chance to squeeze into the future of Russian politics. It is their last chance to stay relevant—and remain sane. On Feb. 5, the first regional PNS branch was created in Moscow, at an event attended by the four co-founders and about 300 of their supporters. According to their plan, by the end of March such regional branches will have been established in 57 of Russia’s regions, bringing a total of 50,000-60,000 members under the PNS banner. This will allow the PNS to meet the requirements to officially register the party with the Ministry of Justice: the existence of more than 45,000 members in at least 42 of Russia’s regions. The founding fathers sounded quite optimistic about their registration prospects. Kasyanov, for example, told Russian daily Kommersant that 1,000 people have already joined the PNS in Moscow and that there were at least 200 members in each of Russia’s regions. However, in case the PNS is denied registration, its leaders promised to bring 50,000 of their supporters into the streets on Apr. 16. Let’s do some math. Two hundred supporters in 83 regions plus 1,000 in Moscow will bring the party membership to less than 18,000. Where will the additional 40,000 members come from? If it took the PNS almost five months to recruit 18,000 followers, what magic tricks do Kasyanov and his pals have up their sleeves to triple this number in less than two months -- before the “end of March” deadline? Well, as they say, politics is a matter of faith, not math. To say that this “program document” is a huge disappointment would be an understatement. Some of the proposed “legislative initiatives”—the establishment of an independent judiciary and reduced taxation on businesses, for example—have long been championed by other liberal parties such as Yabloko and Right Cause. Promises to increase state spending on education, health care and science seem to have been lifted from President Medvedev’s annual address. And some items (such as changing the duration of the presidential term) simply border on delusional, as they would require the PNS to possess the constitutional majority in the Duma. There is absolutely nothing in this manifesto that supports the PNS claim of being the “only viable alternative to the current regime.” Despite all the talks about the future, the “united liberals” is the shadow of the past. Its founders, the “formers,” did have their chance—and they blew it. Is there any reason to give them another?